has the most extensive and connected "bike highway" system in the U.S. They also fly seriously under the radar with a developed art scene. 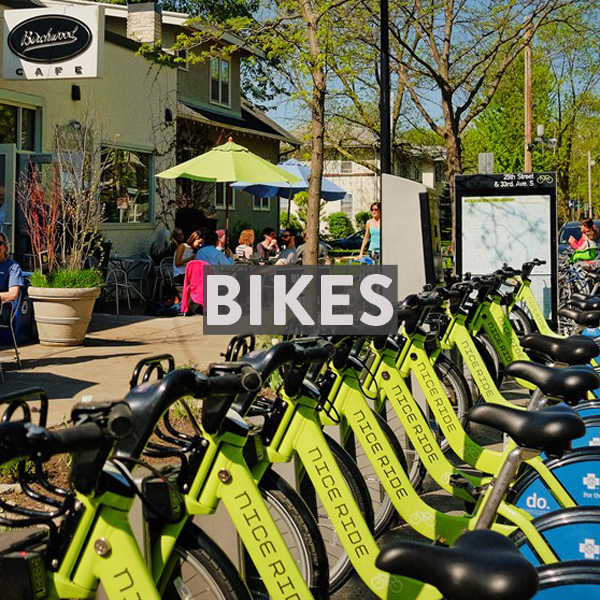 Bikabout's city guide has biking tips, routes curated by locals, and logistical resources you'll need to wander the Twin Cities by bike. Walk Score: 68. Walk Score measures the walkability of any address using a patented system. For each address, Walk Score analyzes hundreds of walking routes to nearby amenities. Points are awarded based on the distance to amenities in each category. Amenities within a 5 minute walk (.25 miles) are given maximum points. Transit Score: 58. Transit Score measures how well a location is served by public transit based on the distance and type of nearby transit lines. Bike Score: 81. Bike Score measures whether an area is good for biking. For a given location, a Bike Score is calculated by measuring bike infrastructure (lanes, trails, etc. ), hills, destinations and road connectivity, and the number of bike commuters. Starting from Chicago, if you head northwest for two hours, you hit Madison Wisconsin. Continuing on for another 4 hours, you will arrive in the greater Twin Cities region encompassing St. Paul and Minneapolis, which currently anchor the 14th largest metropolitan area in the United States. Minneapolis was primarily built on grain, and although none of the behemoth mills in town are still in operation, they left behind some big bones. Most importantly for the would-be visiting cyclist, the mills once required a vast network of rail lines to facilitate all that grain coming in and flour going out, and now that the mills don't need the rail lines, they've been paved over and turned into a sprawling network of cycle paths that connect downtown to pretty much everything around it. Very few other cities have available to them this kind of effortless connectivity over great distances, and Minneapolis has begun to aggressively capitalize on that advantage by turning last century's commercial arteries into this century's version of them. Where once there trundled endless flat cars of midwestern grain, now there cycle endless commuters on their way to earn a living every morning. As with most places that have a robust bike commuter scene, expect to hear (and say) "On Your Left" when a faster bike is overtaking anything slower. Most places in Minneapolis have a wide enough path that passing isn't tight or stressful, so it's rarely an issue. A front white light and a red rear reflector are required by law when it gets dark, and of course a rear red light is a much better idea than just having a reflector. Bikes must yield to pedestrians who have legally entered marked or unmarked crosswalks (as everywhere else), and there is no mention of a helmet law on the city's website. The infrastructure here is pretty phenomenal, and the biking should be low-stress. We didn't see or hear of any amazing levels of bike theft while we were in town. We have no reason to believe bike theft is worse than any other similarly sized city with a healthy biking culture, which is to say that the normal rules apply: Ideally you should be bringing your bike inside overnight. When locking up outside, you should be using a high-quality u-lock at minimum, and a u-lock plus a cable around the wheel and seat is even better. Using a cheap cable lock is a signal to bike thieves that you're tired of your bike, and that you would very much like them to come relieve you of it. Minneapolis has the "midwestern friendly" ethos in great abundance. People are honest, open, and utterly without guile. The strong Nordic and German heritage, in combination to the close proximity to nearly limitless grain fields, assures the modern day visitor an easy time in locating freshly brewed beer of impeccable quality. Additionally, Minneapolis gets a real winter every year, and that pays some interesting cultural dividends. People who choose to live in a place with a Real Winter tend, on the whole, to be people who are upbeat and adaptable. The trivial problems that plague residents of warmer climates simply don't phase people who have adapted to maintaining robust social lives in -20 degrees Fahrenheit. These people keep biking to work, keep going out for dinner, and keep getting outdoors every weekend, no matter what the thermometer says. Expect an uptick in the prevalence of comfort food and good attitudes. These routes were curated by local folk who wanted to share their #BestBikeRide with you. Print off the map for free! 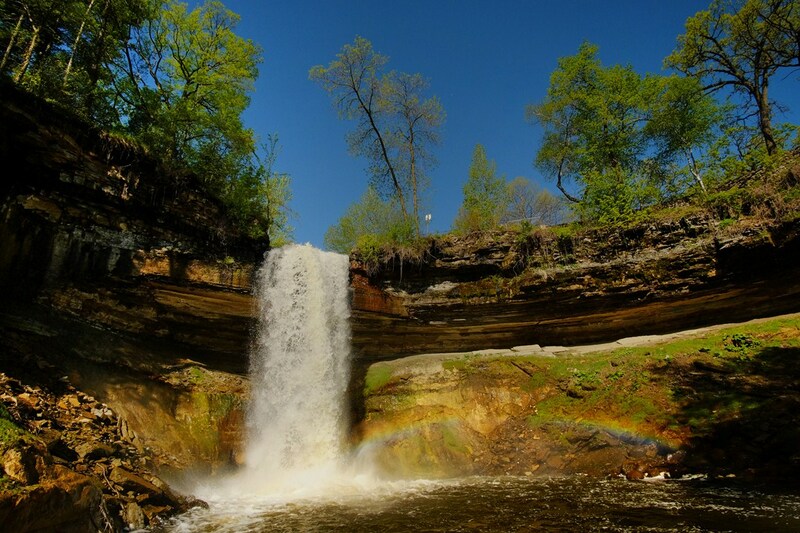 If you live in Minneapolis and love food, music, art or just being outdoors? Curate a route for us by inquiring here. 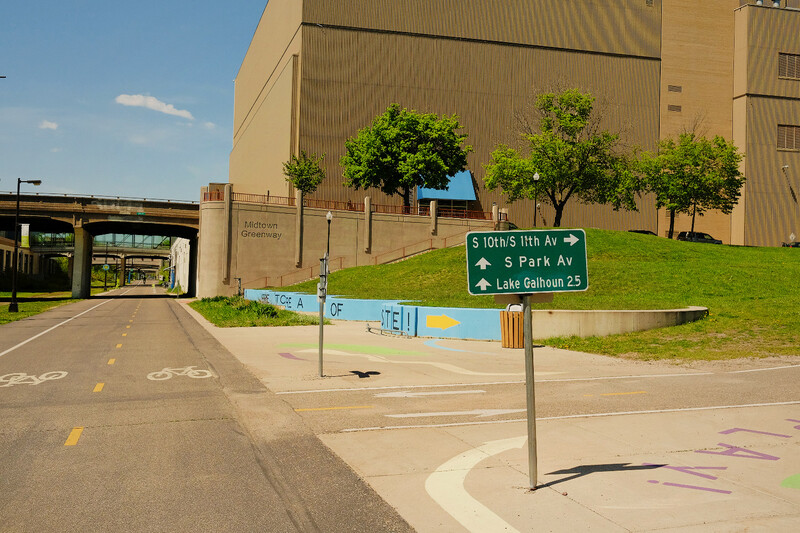 Bike along some of Minneapolis' most popular scenic routes with plenty of stops for public art of all kinds along the way. Minneapolis is home to so many culinary, cultural, and scenic marvels, it's seems that around every corner you'll find another, oh, I've gotta go there sometime! So how about it? This route is perfect for a weekend meander, or a day you didn't know what to do with. Enjoy a day of exploring some of the best that the city has to offer. Hop off your bike to explore a great restaurant, shop one of the city's many fantastic boutiques, see a show, or take in a view. And when you're all done, raise a glass and toast a great day in a cozy Scandinavian speakeasy. You deserve it. A family friendly bike tour of the Minneapolis trails system that includes several craft breweries (with the option to add more), as well as a series of iconic Minneapolis landmarks along the Mississippi River – including Saint Anthony Main, the Stone Arch Bridge, the Mill City Museum, the Guthrie Theatre, and the University of Minnesota. Artabout is a curated arts route exploring art museums, artist studios, and art events around Minneapolis. The route takes you on a scenic ride starting along the Mississippi River where you'll cross the renowned Stone Arch Bridge, see part of the University of Minnesota campus, ride through popular neighborhoods such as Uptown and Northeast, and experience parts of our lovely Midtown Greenway and Cedar Lake bike trail. Along the route, you'll explore a variety of arts stops ranging from renovated warehouse buildings converted into galleries and artist studios to an outdoor arts sculpture garden. I enjoy each of the highlighted stops for their uniqueness in the Minneapolis arts scene and I volunteer at a few of the organizations which is a fun opportunity to meet like-minded people and help support the arts community. America has a new post Turkey Day tradition in which #BlackFriday alludes to the color of the beverage: #BeerFriday! Skip the shopping shenanigans, get outside and commune with fellow beer lovers with Bikabout's map and directory of all the special releases, events, bike tours and more! These 10 North American cities make great travel destinations for casual city biking. Watch for new and updated travel guides at Bikabout.com in 2017! We took our friends who had never been to Minneapolis and gave them the biking experience. Follow in our footsteps with a free bike map and itinerary. Nice Ride (bike share)- $4 per 30 minutes or $10 for a 3-day pass with unlimited 30 minute rides. These are sturdy city bikes with front bag holder, lights, fully enclosed chain guard and skirt guard. Perennial Cycle- $45 daily for a Brompton folding bike includes lights, fenders, bag (optional), lock (optional), and 1 helmet. Minneapolis by Bike- $37.50 featuring city loop, farmer's market and history themes. Perennial Cycle - the cargo / family / transportation bike shop of Minny. They carry all our favorite bike and accessory brands: Brompton, Linus, Gazelle, Larry v. Harry, Brooks, Basil and more! Behind Bars - located in the epicenter of the craft beverage hood in the Northeast, this shop offers maintenance and new and used bikes and accessories. We're constantly updating this list of our favorite local shops, restaurants, cafes, scenic vistas and other nooks and crannies in Minneapolis. These hotels offer complimentary bikes, rental bikes or are located next to a trail or path. Get $35 off your stay by clicking here. Empire Builder (Chicago - Milwaukee - Spokane - Portland/Seattle) - "Bicycles/bicycle trailers may be checked in a bicycle container for $10, in lieu of a piece of baggage. Bicycle boxes are sold at most staffed locations for $15 per box." Sun Country Airlines- $75. Sun Country will accept non-motorized touring or racing bicycles with single seats. Bicycles must have the handlebars fixed sideways and the pedals removed, or be placed in a cardboard container, or the pedals and the handlebars must be encased in plastic foam or similar material. Bikabout donates 25% of annual revenue to local advocates. You, too, can power better biking in Minneapolis and St. Paul by becoming a member of any of Minneapolis Bike Coalition!